Have you ever been in a situation where you had a piece of rope or twine that you need to cut, but had no knife or scissors to cut with? OK, so it’s not a terribly common problem. It certainly doesn’t happen every day, but it could. And, if it ever does, you’ll wish you that you knew how to cut rope in an emergency. Especially since the process is remarkably simple and only requires the rope or twine that you want to cut. 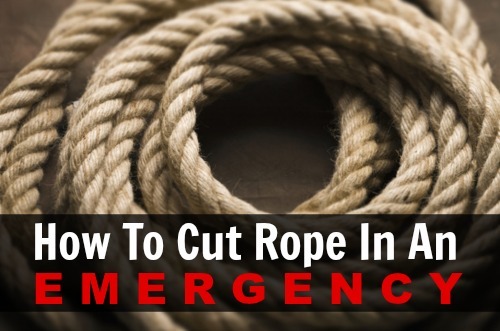 If you are curious about how the process works, then you will enjoy this amazing video that walks you through the process and teaches you how to cut rope in an emergency. It’s easy to imagine several situations where this particular emergency could occur. For example, imagine you’re out camping. Once you’ve unpacked the cook stove and beer cooler, you unpack your tent and tent posts only to find out that all you have is a long length of rope to tie them down with. If you had watched the video than you would now know how to cut rope in an emergency and you’d be home free, relaxing by the campfire with a beer in hand. You’d also be safe in the knowledge that your tent was properly secured for the night. If not camping, then how about out on a boat where you don’t have a knife or scissors. Or, perhaps, you need to know how to cut rope in an emergency in your car. Another spot that could provide an unexpected challenge or emergency would be out in the yard. Maybe you’re tying down some plants or making a border to keep the critters out of your newly planted flowers. You have some rope, but need it cut into smaller pieces. Of course, you forgot to bring scissors or a knife, so knowing how to cut rope in an emergency could come in handy.